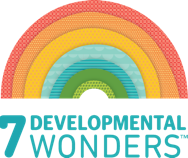 Caters to two stages of development: Batting and sensory exploration (0m+) and pulling for cause & effect learning (5m+). 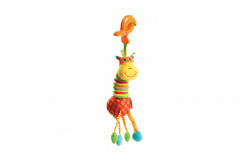 6 different baby-activated toys for fun on-the-go. Tap & play musical feedback. Easily connect the arch to your stroller or baby carrier for fun and amusement on the go. 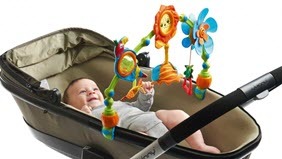 Flexible arch and universal attachment clip let you adjust the toy to your baby's changing age and stage. During the first three months, baby's vision needs to be stimulated. 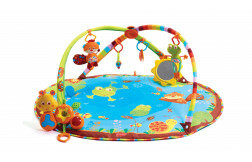 The Musical Nature Stroll’s three colorful toys are perfect for this purpose. 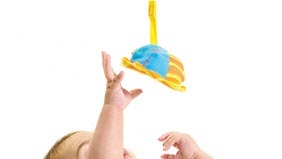 Your baby practices hand-eye coordination, reaching out and batting at the toys. At first he randomly bats the toy causing it to sway. He gradually learns to control his hand and manages to bat the toys deliberately, hold them and pull them to his mouth for further exploration.